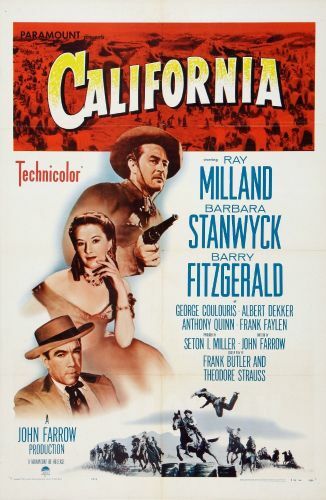 California began life as a remake of Paramount's silent western epic The Covered Wagon, but by the time it emerged on-screen in 1946, the project had metamorphosed into a standard Technicolor frontier "spectacular", concentrating more on star power than anything else. Set during the 1848 mass migration to California, the film stars Ray Milland as Army deserter Jonathan Trumbo and Barbara Stanwyck as "shady lady" Lily Bishop. Since it is clear from the outside that the purportedly disreputable Trumbo and Lily will emerge as the film's true hero and heroine, it is easy to ignore the melodramatic plot convolutions and concentrate on the outsized, well-directed wagon train sequences. George Coulouris has a few ripe moments as a sagebrush Hitler who intends to set up his own despotic empire in California, while Barry Fitzgerald does his usual Irish-blarney routine as an itinerant farmer. As a bonus, Barbara Stanwyck sings a couple of newly-minted "cowboy" songs.